This Wednesday, March 20, at 7:02am (EDT) is the spring equinox, marking a balance between light and dark in our days and the first day of spring! A light- and sun-lover since birth, I feel a sense of relief at this time of year. I’ve made it through another winter and the warmth is on its way back. When I lived in New England, this was only true in theory since it really didn’t get warm until May and then it usually went straight to hot. But here in Virginia at the spring equinox, “spwing,” as my father vernally reminded us, “has spwung” for reals. Natural cycles are reflected in the human body and movement. Not surprisingly (or originally), last year at this time, I wrote about balance (clever girl!). This year, I’m noticing “equilibrium” in my body and in my practice. While I experience “balance” as a verb, a process; “equilibrium” feels like a state to observe and develop. 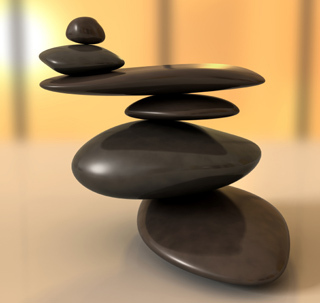 3. mental or emotional balance: equanimity. I love how each aspect of equilibrium has its own sensation and each is a state that we can cultivate in Nia … and the practice of dancing through life. I’ll talk more about that specifically tomorrow, but for today I’ll offer a little body~mind centered theory! The names of the principles themselves show that equilibrium is at the heart of The Body’s Way! The body, Nia, and life are, at their essence, all about a balance between effort and rest, internal and external, upper and lower, left and right, active and receptive, mobile and stable, strong and flexible. Equilibrium and The Body’s Way are about how opposing forces actually create their own state of release and ease. A state of balance due to the equal action of opposing forces. Equal balance between powers. Equanimity. Equilibrium is a state of balanced alignment and grace. Wherever we focus more on one side than the other, the system (be it a body, a practice, or a life) is out of alignment and, therefore, the health of that system is compromised. In Nia practice, a Type-A person who comes in late to class, dives into the highest-intensity songs full-bore, and leaves before Floorplay and relaxation is out of equilibrium and is not practicing The Body’s Way. Neither is the person who daydreams during the movement, chats during the “hard” songs, and gets a drink during freedance. In life, the person who over-schedules every moment, is late to each engagement, and is often in a state of frazzeledness, is out of equilibrium, too. Similarly, the person who moves through life in auto-pilot, not fully engaged when active and not fully resting either is out of The Body’s Way. The invitation of Nia and The Body’s Way is equilibrium: a balanced attention on opposing forces that creates a state of balance and ease. Tomorrow, I’ll share specifically how we can use equilibrium in our movement and in our lives to enhance our health and well-being. Inhale. Exhale. And come back tomorrow! I could feel my breath deepen when I read ““equilibrium” feels like a state to observe and develop” – nice, thanks and big love!